I am feeling mighty blessed. in the space of a week the temperature has gone from arctic to almost tropical (yesterday's high was recorded to be 65 degrees!). according to accuweather the highs for the next week are all above freezing!! of course, this is cleveland, just consider what we were experiencing last year during the same time. but I'm enjoying what we get when we get it! and crossing my fingers that the rest of the month will be very lamb-like. but if the lion returns that's cool too. tonight I'll going to a concert of none other than the legendary joan baez. I have been on cloud nine for the last week anticipating this concert. I've seen joan perform in the past, but always in a setting where she is just one of many performers or where she lends her voice to advance the causes of peace, civil rights, and social justice for all. I remember reading that blogging buds steve and gary went to a baez concert last fall. steve published joan's playlist Iseriously doubt I'll be centered enough to write the songs down, but I'm going with my bud lin and she's got a mind like a steel trap when it comes to music and I bet she will be able to recall each and every song joan plays! hope everyone has a great weekend. and blessings to you! blessed are written by joan and released on her album of the same name in 1971. definitely among the group of my all time favorite songs. for in the shadow of God they sleep. in their personal acquaintance with pain. to carry on this earthly ride. wild deer die in the mountain snow. what comes to one must come to us all. where the waters of joy and hope run deep. and many were the years they tried. and let their souls be pacified. What an amazing lady- I love Joan Baez, her voice, her songs, what she stands for. I hope you have/had an amazing night! It's always amazing to see legends perform in front of your own eyes. She is such a voice for peace. gorgeous photo of Joan Baez (and is that Madame Liberté I see in the background?) Great song, too. Have a wonderful time at the concert. Four out of four here...what an amazing, gorgeous and admirable woman. That is the way to live a life. That's a lovely & moving song-- the fish fry sounded good, too. Have a great time at the show. Wonderful! Have a lovely time - oh boy, it's already after 2 there, I bet you are getting more excited by the minute! I grew up with my mom's LP's of Joan's earlier albums in the house and listened to them through my teen years. Once she became an outspoken advocate for peace and protested Vietnam, my mother lost interest in her music, but I never did. I have never seen her perform. I hope you have a wonderful time! She's an icon alright and extremely well preserved! Have a blast. 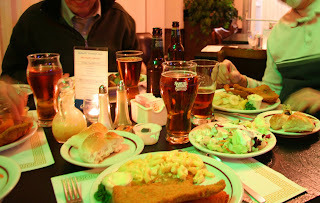 I like the idea of a 'fish fry' thing during Lent too . .not enough catholics over here to give it a go! Woohoo! Lucky you! Have a blast at the concert. And be like me at a John Prine concert: sing along with every song. Lucky you. what a great concert, I love her voice. Ah, Joan. I fell in love with her when I was a teenager. Oh, my goodness - she'll be in Vancouver on the 31st of this month. Maybe, just maybe. I've been a Baez fan forever. Boy, she looks so good. Have a good time and let us know how great it was. I managed a bowling center for a number of year. Many of them are over looked for their good and reasonably priced meals. Sounds like you are enjoying a delightful weekend, Ms. Mouse! Oh Joan Baez! I love her, I hope that you had a fabulous time! I'm going to an Ani DiFranco concert next weekend with my sister so I know how you feel about that excitement. I love weekends! Dennis says the great thing about Joan is that she gets better and better and more talented with age, more creative as she goes along and that is a wonderful thing.